Until that fateful night, Saylor had thought of Tansy as the perfect accessory for his perfect life. She is a volunteer at the college, a good housewife, a pleasant and supportive companion. He is sure that she’s too sensible to believe in silly old wives’ tales about charms and hexes. The drawer full of magical trinkets suggests that Tansy is just as superstitious as any of the tribeswomen Saylor has so condescendingly studied. Saylor bullies Tansy into burning all her charms. She is reluctant to obey, but of course she has no real choice but to submit to her husband’s commands. The only problem is Saylor is wrong. Magic is as real as a punch in the nose. There is a vast and secret magical war raging on the Hempnell campus, each faculty wife conniving to magic her husband into tenure, position, and fame. Saylor has stripped Tansy of her tools and she is now utterly defenceless against her rivals. Leiber set this book in a small institution in the small town America of the 1940s1 , and as a result life is constrained by the strict social conventions of that time and place, including gender conventions that might seem monstrous to contemporary readers … but may have seemed utterly natural to Leiber. The women in this book, Tansy and her coven of rivals, have great power, but they use their power only in service to their husbands’ careers. Their own status and wealth is determined by how effectively they can nudge their hapless consorts toward success. Not that Saylor would ever have admitted that he owed any of his success at Hempnell to Tansy; her skilled performance as faculty wife is taken for granted and her magical endeavours are dismissed as feminine nonsense. Or so he thinks until he finds out what his life without magical protection is like2. Saylor takes his wife for granted, but he at least thinks she’s presentable. He’s not so kind to the other faculty wives and female staff. Each is judged and found wanting in some respect: this one is a hysteric, that one a hag, and so on. It’s lucky for him that women’s magic does not (apparently) extend to directing lightning bolts at male chauvinist pigs, because if it did, I expect he would long ago have been reduced to a scorch mark. At least there are no POC amongst the cast, or I would have to go into considerable detail about how Saylor views the non-whites his work requires him to study. Let us just say when people list works of SFF that were unusually progressive for their time, Conjure Wife will not be mentioned. I would have liked to see Saylor get a well-earned comeuppance after he destroys his wife’s talismans, but alas! that’s not where Leiber is going with this. 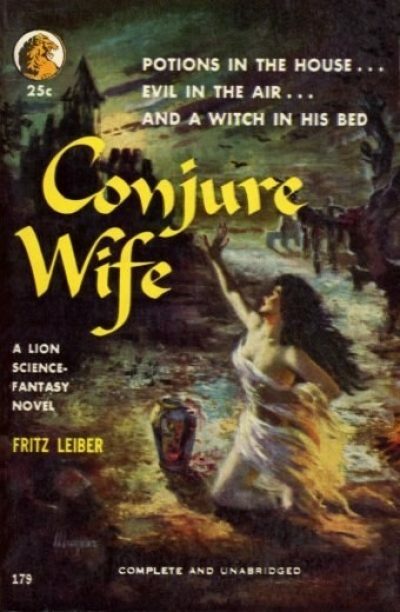 Having presented the horrific spectre of powerful women, Leiber proceeds to reassure his reader that this ghastly situation exists because men have heretofore overlooked magic. Once Saylor can bring himself to accept the unacceptable, that mere women and childlike natives have somehow stumbled into a source of real power, it doesn’t take him long to proclaim a Copernican revolution, a scientific model that unifies all primitive superstition into one rigorous unified theory3. In the end, women’s intuition and native superstition proves no match for masculine intellect. White masculine intellect. Conjure Wife is available from Open Road Media and is recommended as essential reading by SF Gateway. 1: Internal evidence places this book in 1944 or perhaps 1945. The Second World War plays a far smaller role in the plot than one might expect. I don’t think it is even mentioned. This is not an artefact of the book being a pre-war story updated for the 1952 edition: the original version came out in 1943. 2: Even at the book’s end, Saylor isn’t sure if he and his wife were actually fighting a deadly war for their very souls with the rival wives or it was all just some shared delusion. On the one hand, points for scepticism above and beyond. On the other, the walking stone gargoyle seems pretty convincing. 3: True, he has to have one of the other profs check his math. He doesn’t at all seem like the kind of fellow who would set the world on fire. Indeed, none of the Hempnell faculty appear to be more than merely adequate.